Of all these elements of the well-educated child, critical thinking skills are essential to "prime the pump" to further develop all the others areas once a rudimentary skill level has been reached. Unfortunately critical thinking skills generally get short changed when the educational focus is limited to reaching specified levels of reading, writing and mathematical achievement. It is a common complaint from employers, colleges, universities and technical schools that students fall short in terms of the critical thinking skills they need to succeed after high school. In this month's blog, we want to review some critical thinking developmental activities that you can bring into your classrooms regardless of student age or subject matter. At the earliest levels, this can be as simple as identifying matches or differences between simple pictures of items. At higher levels it could be talking about how characters share traits or might be different. In music, it could be identifying changes in tone, mood or technique. In sports it could be identifying errors of technique, game winning strategies, or team behavioral comparisons based on group psychology. Teaching students to make comparisons and contrasts boils down to stating that the focus is "identifying the ways things are similar and different and working on analyzing and categorizing information." Simply stating the focus then targets the discussion and focuses the brain on the development of critical thinking skills. In its simplest form, just having students retell a story means they must summarize the main ideas and the who/what/where/when/why of a story in their own words. They may need help to do this at first, but eventually they will switch from an "open chain" series of steps to a "closed chain" on-the -fly accurate analysis that does not require concentrated thought but is extemporaneous - almost any student can successfully think on the fly with practice. In prompting or developing your students' skills, ask questions that don't have direct answers in the story. Instead of a question like "what color was the car?" and a question like "what stood out or was distinctive about the car?" Ask questions which require analysis and drawing independent conclusions based on facts. Have students compare and contract elements from the story or set of information to their own lives or an outside event. Perhaps have students in a music class identify contemporary music with a similar style or technical aspect that corresponds to the piece being learned or studied at school. Make sure that students can apply information and observations from one set of information to something new or different from how it was originally applied. For almost any subject, you can present only "parts of the story" and ask your students "what happens next?" To figure out the ending requires that they review all the information, analyze and compile it, and draw the likely and unlikely conclusions. This activity can be tailored to help a wide range of students who are either "concrete" or "random" to develop their reasoning strengths, as well as work on developing their reasoning weaknesses. This activity can be a lot of fun either way you decide to proceed, and it will also accomplish many advanced learning objectives along the way. This can be a very simple activity for almost any subject: Write down a list of observations as a group activity. Have the students work independently or in small groups on the possible conclusions that can developed from those observations. A great point to segue into this type of activity is when any student (or you as their teacher) ask "why?" Asking "why" should mean that it's now time to make formal observations and then develop a conclusion(s) that provides the answer(s). Our goal as educators is to produce adults who can figure out "why" on their own without always using Google. Students need to be able to share ideas and learn from each other. Getting along with other people is something we're supposed to learn in Kindergarten. Students need to feel good about stating their evaluations of information, defending their opinions and respecting the opinions of others. At the start of the educational spectrum, this can be communicating in the sandbox or on the playground. In a secondary subject, this can be using a framework such as a Harkness table to provide rules for working cooperatively. Socrates used questions to develop critical thinking. To answer a question you have to understand what is being asked, apply it to what you know, synthesize an answer, and be prepared to defend it (if it generates more questions). Your students probably are good at asking questions of their peers as well as of you, so why not put this to a productive end? You can always jump in to guide the discussion by posing questions taking an opposing view to get your students to defend their positions or correct a fallacy in their facts or logic. Identify, clarify and label the differences between opinion, judgement and facts. For a simple subject or small set of information, this could be completed in a single class period by experienced students. At a lower level, or for a more complicated topic, this activity could be spread out over several days or weeks. Hopefully this blog will give you some ideas. If you can't figure out when to teach critical thinking or how to fit it into a lesson plan, perhaps try making a "spinner" or a custom deck of cards (each with a critical thinking activity mentioned above) to use to randomly pick a critical thinking activity to use daily as part of each classroom lesson. 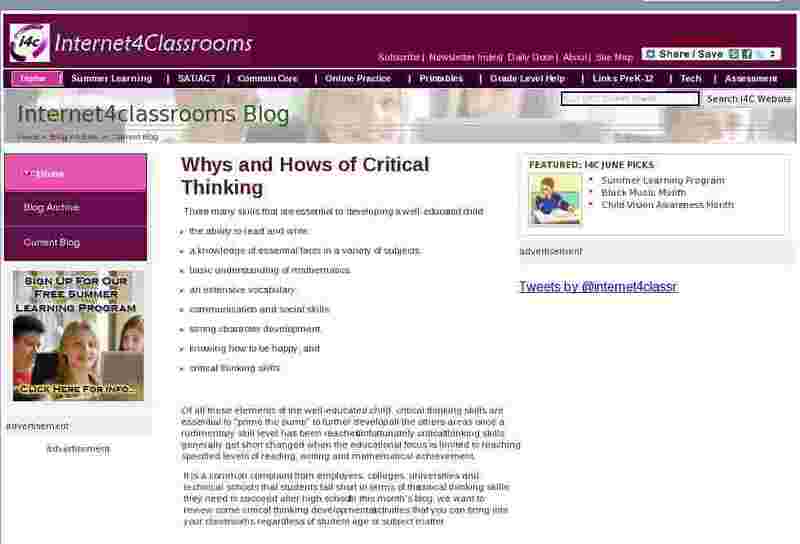 That way you'll get critical thinking added every day to your classroom. You'll be amazed at how much quicker your students acquire knowledge and achieve success in the classroom and beyond!